Donald Trump depositions give insight into beliefs. 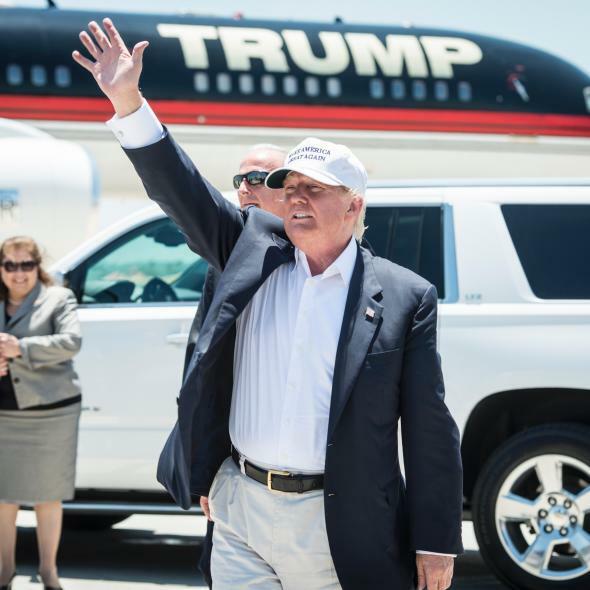 Republican Presidential candidate and business mogul Donald Trump exits his plane during his trip to the border on July 23, 2015 in Laredo, Texas. Donald Trump says a lot of things out loud—some true, some true-ish. Pinning the Republican frontrunner down on just about anything has proven exceedingly difficult. Trump, unlike other candidates for president, doesn’t have a long record of public policy statements. Trump’s life, despite being part reality TV bravado, is also hard to triangulate other than what Trump says has happened. Moments of clarity are rare, but as the Daily Beast’s story about his divorce from ex-wife Ivana Trump shows, the clearest picture behind the public persona is through the billionaire’s favorite rhetorical threat—the lawsuit. Trump being Trump, as well as a businessman in commercial real estate in a rough-and-tumble New York market, he’s been before his fair share of judges and been seated, under oath, for depositions more than your average candidate. The New York Times parsed hundreds of pages of Trump testimony from lawsuits since 2007. Here are a few under oath gems they uncovered. “Have you ever exaggerated in statements about your properties?” one lawyer asked him. “I think everyone does,” Mr. Trump replied. “Does that mean that sometimes you’ll inflate the value of your properties in your statements?” the lawyer tried a moment later. “Not beyond reason,” he answered. Alcohol? He does not touch it, Mr. Trump testified. Text messages? Not for him… In 2007, he said he had no home or office computer. “Does your secretary send emails on your behalf?” he was asked. His secretary generally typed letters, Mr. Trump said. “I don’t do the email thing.” By 2013, Mr. Trump was still not sold on email. “Very rarely, but I use it,” he said under questioning.